As Easter approaches, I started hunting for Easter eggs a little early. I’m sure many read the #LEGOEaster contest announcement, skipped ahead to the prizes, jumped to what they had to do to enter, then raced off to take their photos and upload them to Flickr. But there was some Easter Eggs in there for those who read the announcement with more intent. This might not be so hidden, but Easter egg hunters racing after the “big” prize could’ve easily overlooked it. Being named as a source of inspiration alongside our friends at Stuck In Plastic was such an honour. It shows that the work we do and the contributions made by you are not unseen by LEGO. Another Easter egg! This contest is only open to those affiliated with a Recognized Lego User Group (RLUG) or Recognized Lego Fan Media site (RFLM). We define active members of the Toy Photographers community as: writing for the blog; commenting on blog posts; commenting on our IG feed; being an active member of our G+ community; or attending one of our photo meet-ups. This means that LEGO is rewarding its groups, like ours, by limiting the entrees to only their members. Fewer hunters suggest there is a greater likelihood of eggs! The best Easter egg that was hidden within the announcement, needed a little extra searching and digging. The Lego Group may be looking at this Flickr Pool as a resource for their social media channels. What? Yep! Just by entering, LEGO might select your photo, or because of your photo they might peruse your chosen social media platform and want you include your work in upcoming projects. I can hear the cynics now. “As if that’s gonna happen!” I might? It has in the past. It happened to me. The LEGO Life team contacted me a while back, after seeing my photos on Stuck In Plastic and then looking through my Instagram feed, and asked if they could feature some of them in the LEGO Life app! If LEGO like your image and want to use it, they will contact you directly and ask permission. How rad is that?! So, now that I’ve rummaged through the contest announcement and found some other Easter eggs that you might want to put into your basket alongside the chance of winning wonderful prize, what are you waiting for? Ten lucky winners will be drawn at random from a flickr pool of images and awarded a “goodie bag with LEGO related Easter awesomeness and a medium sized LEGO set on top.” The deadline to enter the contest is April 16th. Ten winners will be drawn randomly from the Lucky Draw Flickr Pool. Winners will be contacted via Flickr Mail asking for your full name. Its up to the Ambassador of your RLUG/RLFM to verify your affiliation. Your prize will ship once your affiliation with an RLUG/RFLM is confirmed. This is a wonderful opportunity to show the folks at LEGO how awesome our community is. 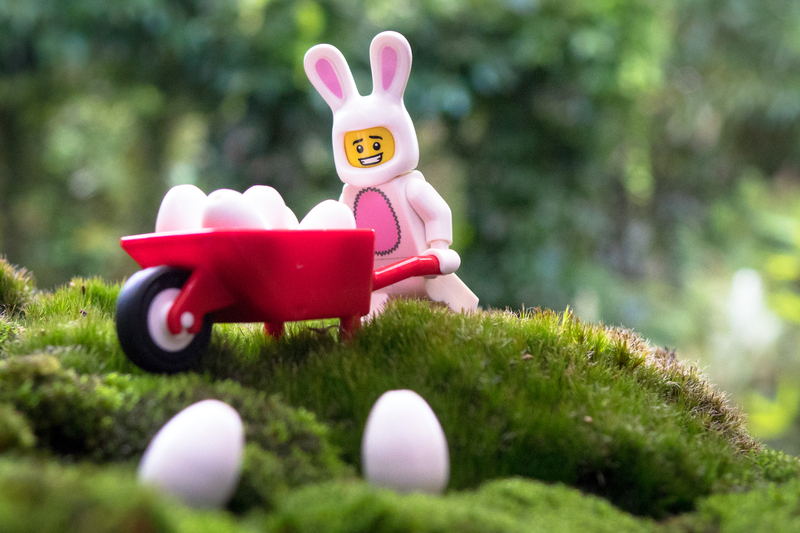 We hope that you’ll join in the fun and post your Easter themed images around the Internet using the hashtag #LEGOEaster and to the Flickr Pool to be in the running to collect some Easter goodies! I love all Easter eggs. My fav Easter egg in this contest is the third one, having LEGO choose one of my photos to use on their social media or LEGO Life. 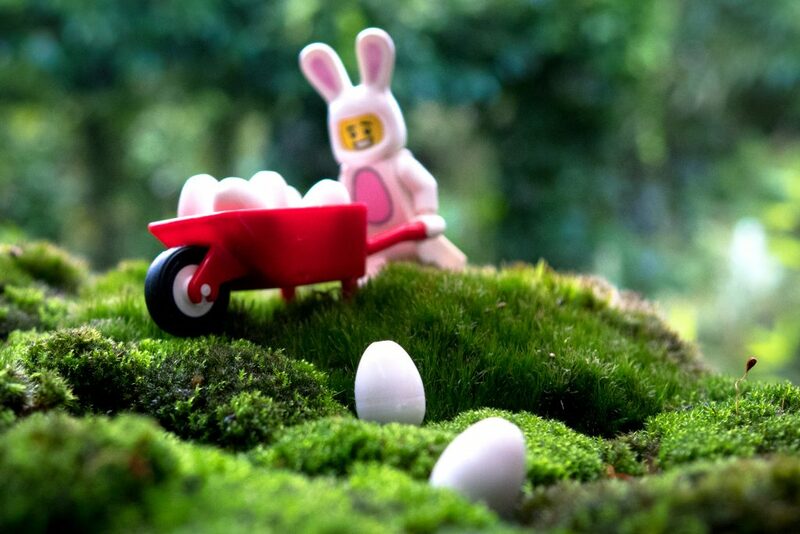 A prize would be cool too, but if LEGO chose one of my photos, it would be like all my Easter eggs came at once! I gave all my bunny suits away, unaware of their value at the time. But now I have a couple of little bunnies, a blue bunny which I did plastic surgery on to remove the key ring, and I have a few ideas outside of the box that I hope to share in a few days. I think sometimes folks forget who might be looking. As this contest is run by LEGO, of course they will see the entries, and who knows what might come from that? I look forward to seeing your Easter photos. The first Easter egg was my favourite find too! Being name checked alongside our friends at Stuck In Plastic as inspiration was a lovely nod to the things we do.